Noun is a word that refers to a place, thing, person or idea. 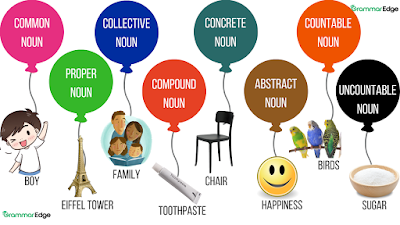 There are 8 types of nouns in the English language which are discussed below. Proper nouns make common nouns easy to distinguish and understand. These are used to make common nouns special by giving them a particular name. In written English, a proper noun always begins with capital letters no matter where they are used in the sentences. Collective nouns represent the names for a collection/group or a number of people/animals, things or ideas. It is a collection of common or proper nouns. Nouns that can be identified through five senses (taste, touch, sight, hearing, or smell) come under concrete nouns. They can be touched, smelt, felt, seen or heard. Abstract nouns are the exact opposites of concrete nouns. These cannot be identified through the five senses. The nouns that cannot be counted are called uncountable nouns or mass nouns. It is hard to use them with a quantifier like one, three, four. All abstract nouns are uncountable.